Industry trend toward miniaturization is leading to finer pitch requirements, high tolerances, and greater repeatability. Our state-of-the-art laser technology enables our customers to experience positional accuracy unattainable with conventional technology. Through this process, we can manufacture a laser cut stencil with aperture openings down to .003 inches. For optimum paste release, all of our Laser Cut stencils are tapered to be a 1/2 mil. Electroforming technology – by definition – provides your manufacturing process inherent advantages over more traditional methods. Component or Stencil Design - As a new technology for most manufacturers, Electroforming only produces advantages for you when you have the knowledge to take advantage of its capabilities. Great Lakes Engineering can provide experience you can use to enhance your product design. Artwork Development and Proofing - Great Lakes’ greatest strength is its engineering team. With complete, in-house CAD services, we can work directly with you to prepare and enhance your designs. Substrate Penetration - In essence, Electroforming is a constructive (material ‘growing’) process, not a destructive (material ‘cutting’) process. Therefore, surface preparation and cleaning is critical to providing a chemically appropriate surface on which to grow your component or stencil. Exposure - UV light exposes the precise growth area of the substrate material creating a chemical bond between the metal and the substrate. Areas not coated will form no such bond. Development - Areas not chemically bonded are dissolved from the substrate material. Plating - Now that the pattern is set, metal is deposited to the mandrel in a electrochemical reaction – transferring the desired material into the precisely prepared area. Separation and Mounting - After a cleaning process, the part is removed and prepared for inspection or another round of plating (depending on your requirements). Inspection - We employ a variety of precision measurement scopes and instruments to ensure the part has been manufactured to your approved specifications. Great Lakes Engineering also offers step etching to help you decrease paste volume in specific areas on your stencil. This process is an elimination of partial metal thickness and is usually done when modifications to certain apertures cannot be made. Great Lakes Engineering produces a wide variety of small, hand-held stencils. These can very from simple single-foil BGA rework stencils to more complex multi-foil framed stencils. Mini-stencils can be manufactured to your specific requirements to allow deposition of solder paste in tight places. These can be manufactured to thicknesses of .001” through .040”.Also, we can and include tabs and “half etch” bend lines on the stencil. This allows for a “handle” to be folded up. This makes it easier to place and remove the stencil. The following frame sizes are what we currently carry in stock. We can accommodate any special needs in additional frame sizes not listed. All our frames are made out of aluminum, with either tubular aluminum frames, or aluminum caste frames. 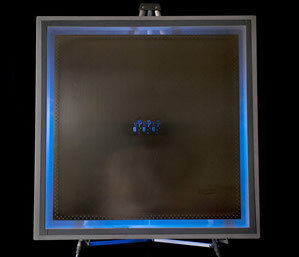 Great Lakes Engineering now offers low profile stencil frames as an option on 29" x 29" orders. The new frame is over 60% thinner than standard frames, saving valuable shelf space. This system consists of two parts. 1. The "Spacer Frame" measures 29" x 29" O.D x 1" high. You'll need one "Spacer Frame" for each printer. 2. The "Space Saver Frame" measures 29" x 29" O.D. x 1/2" high. This frame is stretched with polyester mesh to provide a flexible mounting platform for stainless steel stencils.Space Saver Frames The idea is simple. Each printer will use one "Spacer Frame" like a mounting platform. Simply interchange the thinner frames when the run changes. You will be able to store three frames in the space of one, saving real estate around the equipment. We understand quality and compatibility are - rightfully - your main concerns. The "Space Saver Frame" is attached to the "Spacer Frame" using pins that are permanently captured in the "Spacer Frame". Bushings pressed into the "Space Saver Frame" receive the pins and prevent the assembly from shifting while being installed in the printer. Simply put, the product is designed to hold the same dimensions as the frame it replaces, ensuring a transparent transition. The system also eliminates problems associated with shipping bare stencil foils to SMT Printers, such as foil damage when attaching to frames and finger cuts. Because only the Space Saver Frame is sent to stencil washers there is no concern of damage to base frames from cleaning chemicals. Our stencil supplier Great Lakes Engineering developed a space saver stencil that is a two piece stencil. As can be seen in Fig 1 & 2 it saves space by reusing the top 2/3 of the frame and needing to store only the bottom 1/3 of the stencil that contains the circuit pattern. Fig 3 shows the width of a standard stencil, which is 1.5”. Figure 4 shows the width of the space saver stencil, which is 1/2”. This will allow us to store 3 stencils in the same amount of space currently occupied by one of our stencils, freeing up valuable floor space. Electroless Nickel Plate is also a post manufacturing process that deposits a thin layer of nickel on your stencil which provides a much harder, smoother surface on the inside aperture wall, and the stencil surface. This increases solder paste release properties.